On Tuesday, Sharon Rowe (ECOBAGS.com founder & CEO), was a guest on the Mary Jones Show on WDRC-AM. Sharon and Mary talked about Sharon’s new hobby, making homemade soaps & lotions. 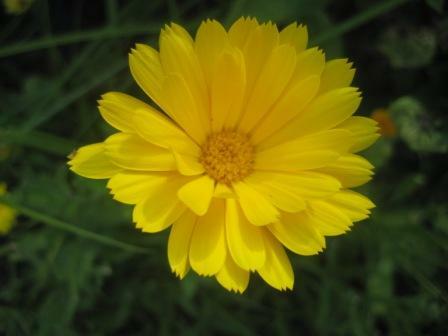 Here is the info on the Calendula Moisturizing Cream that Sharon described. Thanks to Bonnie’s Herbals for the recipe and for permission to share with Mary’s listeners and YOU! 4. Put the cup into a pan partially filled with water, place over medium heat, heat and occasionally stir with a chopstick or spoon until the oils and beeswax melt and dissolve into a uniform liquid. 5. Remove the cup from the hot water and allow the mixture to cool to body temperature. As it cools the mixture will become thick and opaque. Stir it as it cools to keep the consistency smooth and uniform. 6. When the oils are cooling, poor the distilled water into a measuring cup and put in the pan to heat it to body temperature. into the machine, then slowly add the oil mixture by pouring a thin drizzle into the whirling water. It will begin to thicken and sputter, continue to process until the oil and water have blended together into a thick, creamy liquid. This could take 5-10 minutes in a blender or food processor and only about 20 -30 seconds in a vitamix. 8. Add the essential oils and then blend for a moment more. 9. Pour the cream into very clean, dry jars, filling them to the top. You want to tap them to eliminate the air bubbles. I find that my creams last for a minimum of 6 months.